Okay, heard today that they’re making another Hollywood movie of The Great Gatsby with Leonardo DiCaprio in the lead role. 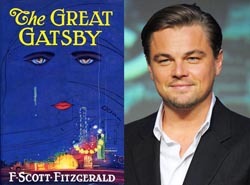 Mixed feelings about this – someone out there asked the question, do we really need another Gatsby movie? As far as I’m concerned, there’s always room for one more. I’ve seen three different versions, and I haven’t been a big fan of any of them (yes, including the Robert Redford one. And yes, I’m aware of the heresy.) I don’t think they captured the true essence of the book – you watch the Redford version today, and it looks more 70s than it does 20s. I’ll add that I won’t hold out too much hope for the new version either. I liked DiCaprio in his other period pieces (Titanic, Aviator) but… maybe I’m just too close to the book. I also think we’re too far away from the 20’s. It’s been 85 years since the book was published, after all. Hard to capture an era when there’s nobody around to remember it. Anyway, bring it on. I’ll certainly be open to giving it a try. Great work today. Good scene and a good number of words. Tried to reach 75,000 words today, but came up short. I can’t be too disappointed about that though – I’ll beat on, boats against the current again tomorrow. This entry was posted in Daily Report and tagged a few strong words, Fitzgerald, Great Gatsby, novel writing blog. Bookmark the permalink. Re: Gatsby… yes, Redford’s looks very 70s. I can see DiCaprio doing it, actually. I think he might be able to capture more of the slight inner fissures I’d want in Gatsby than Redford could… he just was too self-possessed in that role (to me). Keep up the great work–and worry less! You’ve come so far!! The boat’s still moving, so I’m considering that to be a little victory in itself. I had to abandon last night’s hour though due to a bout of… something. Not even sure what it was/is. Just getting into the office now, as a matter of fact, and still a little light-headed. I love Redford, but he seemed too forced in that role. I keep thinking, that was probably on purpose, because all the way through the book Gatsby himself seems forced, putting on his “old sport” act. Maybe his portrayal was just over-the-top – I don’t know. It just didn’t ring true to me. On the other hand, I really like Sam Waterston as Nick, but not enough to save the movie for me. lol – trying to worry less, but I think it’s a natural part of the creative process. Pingback: Day 863 - Another Gatsby Film Flop?